Create the best seat in your house with this plush chair. 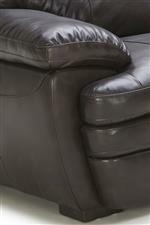 The piece features padded pillow arms and back, with the channeled back promising luxurious support. Contrast stitching on the back, seat, and sides bring a subtle tailored detail to this comfy chair. The 5073 Chair with Pillow Arms at Becker Furniture World in the Twin Cities, Minneapolis, St. Paul, Minnesota area. Product availability may vary. Contact us for the most current availability on this product. This collection offers plush seating options and casual style. Tailored elements like contrast stitching bring a level of refinement to thick padded arms and plush channeled backs. Complete any lounge space or entertainment room with this group's ultra-comfortable sofa, loveseat, chair, and ottoman. The 5073 collection is a great option if you are looking for Casual furniture in the Twin Cities, Minneapolis, St. Paul, Minnesota area. Browse other items in the 5073 collection from Becker Furniture World in the Twin Cities, Minneapolis, St. Paul, Minnesota area.